Cristiano Ronaldo and his couple Georgina Rodriguez were seen at the Malaga Airport on Sunday, June 3rd, 2018 after spending a holiday with their family and friends through the port city on southern Spain's Costa del Sol, Marbella. 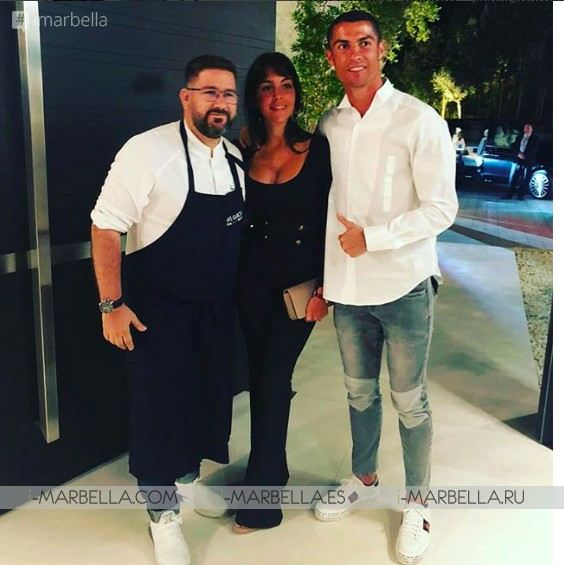 Ronaldo and Georgina traveled to Marbella last week on Wednesday to celebrate his fifth Champions League triumph with CR7 Junior, relatives and friends. Ronaldo started the week enjoyed a romantic dinner with Georgina at the newest restaurant Nobu (from De Niro and Chef Nobu). On the next days, the Real Madrid player had a long schedule, from brushing up on his tennis skills playing with his best friend Miguel Paixao to a family break on a yacht in Marbella, Puerto Banus where he enjoyed some family time. Ronaldo and Rodriguez had also time alone when they were spotted soaking up the sun in Malaga before boarding a private flight on Sunday afternoon. After a wonderful meal prepared by Dani García, one of the country's leading chefs in Spain who has two Michelin stars for his restaurant BIBO and Dani Garcia in the Marbella Hotel Puente Romano Beach Resort & Spa. The couple Ronaldo and Rodriguez have also enjoyed a meal at the restaurant ‘Takumi’ in 'La Zagaleta'. Dani García posted on his Instagram; ''Cooking for someone special, second round in three days !! Cristiano and Georgina.'' thanking the couple for their visit. Another restaurant who have the pleasure to host the couple was 'Ta-Kumi''. The Chef Alvaro Arbeloa posted on facebook a message thanking the couple. ''These days, we had the pleasure of serving two great people in Zagaleta, Cristiano Ronaldo, and Georgina Rodriguez. It has been a pleasure and a wonderful experience to work for you. Thank you for your trust in Ta-Kumi''. Continuing the holidays, Ronaldo’s family were seen boarding a yacht, named Ascari, is quite similar to the one he used on a trip to Ibiza at the beginning of the summer in 2016. From modern and sporting lines, it stands out for its large size, about 40 meters, an aluminium design, and its characteristic dark grey colour. 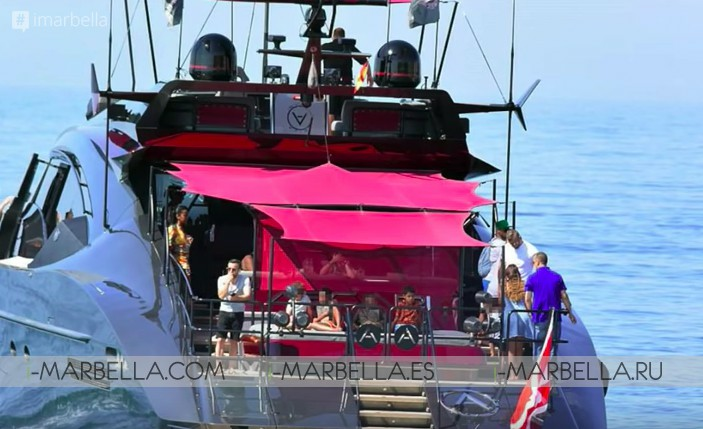 That type of boats can be rented in waters of Marbella, and its price can be around 90,000 euros per week. On the yacht, Ronaldo and Georgina were joined by their relatives as well as friends of the couple. They enjoyed the very stunning views and sun at the Costal del Sol. Some of them in a very cozy way with a giant bed setting in where they could enjoy the trip around the Mediterranean sea around Puerto Banus and Marbella. Georgina posted a video on her Instagram wondering his fans how brave she is? Definitely brave! During his time in Marbella, Ronaldo posted on his Instagram a picture of himself and his best pal Miguel Paixao on a tennis ground, stating ''Vencedores'' champions. The 33-year-old champ, Ronaldo missed while these holidays two games with Portugal national team after helping Madrid win their third consecutive Champions League against Liverpool. Although, he's planning to join this week with his Portugal team-mates. He should be available for a final pre-tournament fixture against Algeria in Lisbon next Thursday. Cristiano Ronaldo and Georgina Rodriguez are seen going to the airport on June 3, 2018, in Málaga, Spain. Finally on Sunday, June 3rd. Ronaldo has seemed to take a separate mini-break with just Rodriguez, as the couple was spotted soaking up the sun in Malaga before boarding a private flight in the afternoon. Ronaldo will participate with his national team Portugal in the 2018 World Cup in Russia planned to begin on June 14th.